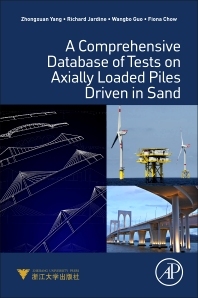 A Comprehensive Database of Tests on Axially Loaded Driven Piles in Sands reviews the critical need to develop better load-test databases for piles driven in sands. The key quality parameters, population of current entries and reporting formats are described before offering preliminary results obtained from comparisons between axial capacities calculated by various predictive approaches and site measurements. This book also shows that the "simplified" and "offshore" ICP and UWA variants proposed by some practitioners are over-conservative and that their use could be discontinued. The new pile capacity and stiffness database offers a broad scope for evaluating potential prediction biases relating to a wide range of soil and pile parameters. Submission of further high quality tests for inclusion in regularly updated versions is encouraged. Dr Yang obtained his Bachelor and Master degrees from Zhejiang University in 1998 and 2001, both in Civil Engineering. In 2005, he earned his PhD degree in the Hong Kong University of Science and Technology. Prior to join the faculty of Zhejiang University, he did postdoctoral research in the University of Hong Kong from 2006-2007 and Imperial College London from 2008-2009. Dr Yang has published more than 40 journal and conference papers. Dr Yang is the reviewer for 10+ international journals in Geotechnical engineering, including Géotechnique, J Geotech Geoenviron Engineering (ASCE), Canadian Geotechnical Journal, etc. He is a member of the ISSMGE, and serves for several technical committees in Chinese society. Recognition of his research achievement, in 2012, he received a first prize with other collaborators on the Science and Technology Achievement conferred by Ministry of Education of China (MOE). He was also awarded the second prize in the Science and Technology from the Ministry of Science and Technology in China in January of 2014. Professor Jardine is an expert in areas of soil properties, offshore geotechnics and geohazards, driven pile behaviour, advanced laboratory and field measurement techniques and instrumentation, etc. He has published 200 papers, chaired the International Committee TC-29 on Advanced Laboratory testing and acted as a Visiting Professor in three countries. Recent international conference keynote lectures include the 2007 London Offshore Geotechnics (OSIG) Conference, the 2008 Offshore Site Investigations Forum, and the IS-Shanghai Particulate Mechanics Conference in 2010. He delivered the Zheng lecture in China in 2008, the William Mong Lecture in Hong Kong in 2011 and a keynote at the London 2012 OSIG Conference. He will deliver the Bishop Honour Lecture at the 2013 Paris ICSMGE.